NOT reproducible with "LibreOffice 3.4Beta3  – WIN7  Home Premium  (64bit) German UI [DEV300m103 (Build:3)]"
Please contribute all available information concerning your Linux distribution / version and your LibO download files. The problem is not related to Libreoffice but to the particular theme I was using (Elementary). It seems that the problem is due to a the fact that libreoffice does't respect the gtk theme under a certain scrollbar height. 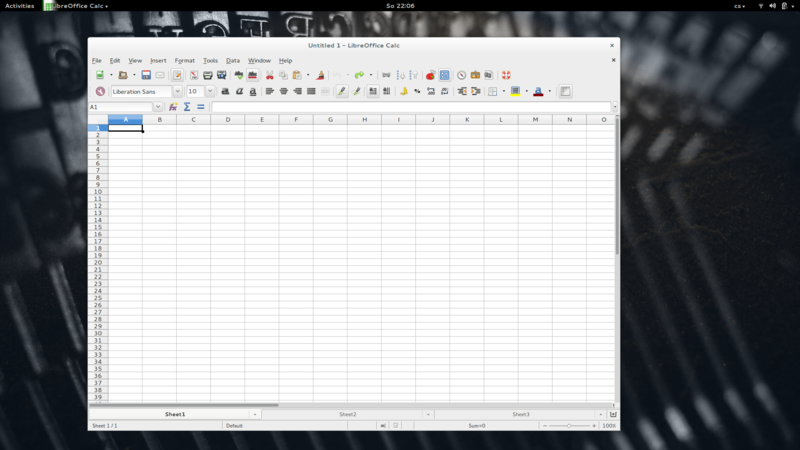 So the bug should appear on any gtk theme that has small scrollbars I guess. I've the same problem on Ubuntu 10.04 with Unity. The tabs are very small compared to e.g. the icons in the toolbar. You might even say that the tabs are rather ugly. Note that this is not an issue on the Windows version. The text in the tabs is hard to read, the navigation buttons at the left are also too small. Ubuntu 10.04 + Gnome and Crunchbang 11 + Openbox screenshots. Neither appear to exhibit unusually small sheet tab size (as demonstrated in this bug), although the size is not overly large either (especially when compared with the Future State UI attachment in bug #39013). I am experiencing the same problem with the sheet tabs being so small that I can not read them. I recently removed and installed the update to v4.0.1.4 and am still having the issue. I verified that I do not have overlay-scrollbar installed. I am not running the Oxygen theme but the default Lubuntu theme. How about adding a minimum-height value or min-textsize value to the ui to prevent this problem? That would help to make the tabs readable again. The ideal solution would be to have tabs in a separate row. Aside from being able to display the scrollbar as it is intended to be displayed, this would also improve the problematic tab scrolling problem by increasing the space for tabs. Tab switching can be very painful in Draw, as it's quite common for vector drawings to have numerous layers. It also presents an opportunity to redesign the tabs -- see attached mockup. I do not like that proposal. Sorry. Note that the reported problem is related to a certain theme and that LibreOffice does not force to show a minimum hight for the tabs. So I (and many others) do not have the problem. > I do not like that proposal. Sorry. > LibreOffice does not force to show a minimum hight for the tabs. > So I (and many others) do not have the problem. The problem actually IS because the height of the sheet-tabs is bound to the scrollbar height. That should not be like this because u make theming difficult! The proposal from Mirek2 is quite good and should be implemented asap! > The ideal solution would be to have tabs in a separate row. Agreed. I feel this is a pragmatic design solution. I have no idea how easy it would be to implement, but it at least indicates the direction to move in. Here's a new mockup, one which fits the Tango aesthetic more and carries across its function (tabs) better, though would probably be harder to implement: https://wiki.documentfoundation.org/images/7/73/Calctabs.png . Alternatively, we could go for a copy of Gnome's new tabs, which fit in with our icons as well. This is an issue on Windows 8.1 as well. No way to change the theme, so there needs to be another resolution. In this case the bug report was never independently confirmed so correct status is UNCONFIRMED. Thanks! Comment 8 (AskLO link), comment 9 (with attachment) and comment 10 offer confirmation, all separate from the OP. Status set to NEW. Apologies for not doing this earlier. As per comment 8 I am still uncertain whether this is a bug report (GTK theme issue) or a request for enhancement (proposal by Mirek). > This is an issue on Windows 8.1 as well. Platform set to x86 / All, although it would be good if a screenshot showing the issue under Windows 8.1 could be attached. fdo#36772 Move the scrollbar and sheet tabs in a separate row. I just got sick of tiny tabs (especially with a new monitor) so I moved scrollbar and sheet tab bar each into its own row. Comments? A few hours ago I though about fixin this bug, but then digged into other areas. I have also made some visual changes to the tabs (rectangular, more plain look) but that should go into a new bug report I guess. Also this change is only for Calc for now..
Btw, in Draw there is the same problem (as you might know) - not sure if we have a bug report for it. I can confirm that master 4.4.0.0.alpha0+ now no longer shows the problem. Thanks. Look forward to this rolling into the released version. There are a small problem when you switch the sheets to Right-to-Left view, the + button disappears as seen in the screen-shot. Do we need a new bug report? Yes, a new bug report would be better. And add this bug as reference and add me as CC. Sheet tabs (Calc) and layer tabs (Draw) were moved to an independent row and are no longer displayed next to the horizontal scrollbar. As many visual styles under Linux (in addition to the default OS X configuration) use very thin scrollbars, these rendered the tabs too small to be clickable and, most importantly, readable.